When designing a structure which is clamped by bolts, it is important to note that pre-tensioning of the bolts is advantageous for design and implementation purposes. Bolt pre-tension increases the stiffness of the structure and thus causes the shear stress to be transferred mostly between the plates through friction. 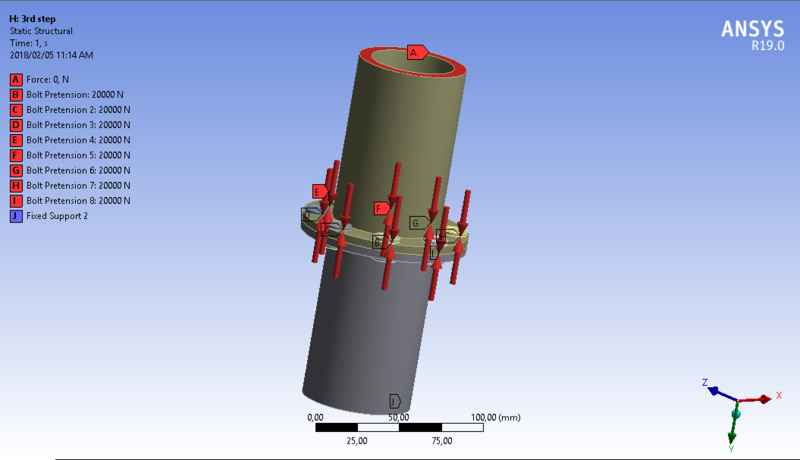 When performing an FEA simulation, it is important to remember to apply the bolt pre-tensioning in the correct manner such as to accumulate more accurate results. This document will provide a short tutorial on how to set up bolt-pretension properly in ANSYS Mechanical and to show comparisons of how the results differ when setting it up incorrectly. Firstly, let’s get down to the basics and explain the core principle behind pre-tensioning by making use of a classic example, namely a beam in bending as seen in Figure 1 below. It is evident from the above-mentioned result set that the deformation from scenario 2 differs by 3,85% which, depending on the application, could have a significant impact on the accuracy of results needed. In the following example, two plates are bolted to each other. The bolts were given a pre-tension of 20kN and the load applied to the centre of the plates has a magnitude of 30kN. Figure 4 shows how to set up the bolt pre-tension correctly. The tension load should be applied in the first step, and step 2 and 3 should be locked. This ensures that the pre-tension is not applied in every load step. It is a common misconception that the load should be applied in all three steps. Thus, the two cases shown below show the difference between applying the load in all three steps and applying the load only at the last step. For case 1, the load was applied in all three load steps as shown in Figure 5. This is also where the load step can be altered. Figure 6 shows that the load is only applied in the last/third load step, which resembles case 2. Take note of the Load vs Time graph which visibly explains how the load will be applied during the simulation. The results of the simulation can be seen in the table below. Attention was given to the total deformation and the gap that is created when the maximum force instance occurs. Case Total Deformation [mm] Gap [mm] Case 1 1.1209 0.76458 Case 2 1.1153 0.60997 It is evident from the results above, that the total deformation difference between the two cases lies at 0,499%, which is not significant. However, the gap difference lies at 20,22%, which is a significant amount. However, the above-mentioned example is rather a simpler case. Let’s have a look at an example that is more relevant to industry applications and that has significantly more bolts connecting the structure, shown in Figure 7 below. Once again, both cases were tested where the load is applied in all three steps or just in the 3rd step. The case numbers will be as assigned to above. The table below shows the results for the above-mentioned example. Case Total Deformation [mm] Gap [mm] Case 1 0.19831 0.14488 Case 2 0.16863 0.11408 The total deformation differs by 14,97% and the gap differs by 21,26%. The differences are significantly higher/worse than the simple example that was shown earlier on. This goes to show that applying the load in the wrong load step could have significant consequences for bolted connection designs, depending on size, geometry and magnitude of loads applied.